Image: Aung San Suu Kyi's "Saffron Monks" are committing genocide in Myanmar. The West has both created this movement and is silently supporting it, hoping to disrupt and ultimately drive out extensive Chinese interests found at the epicenter of the violence. 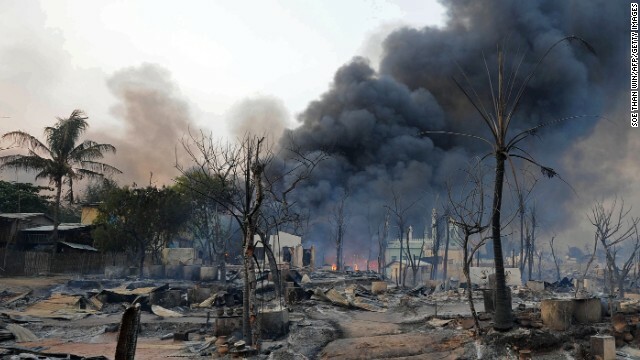 "The ongoing intercommunal strife in Rakhine State is of grave concern," the International Crisis Group said in a November report. "And there is the potential for similar violence elsewhere, as nationalism and ethno-nationalism rise and old prejudices resurface." CNN's citing of the corporate-financier funded "International Crisis Group," which has supported and engineered similar strife elsewhere around the world, including Egypt in 2011, is particularly foreshadowing. And as in previous spates of recent violence, Aung San Suu Kyi has once again allowed opportunities to call on her own supporters to stand down, slip by in silent complicity. 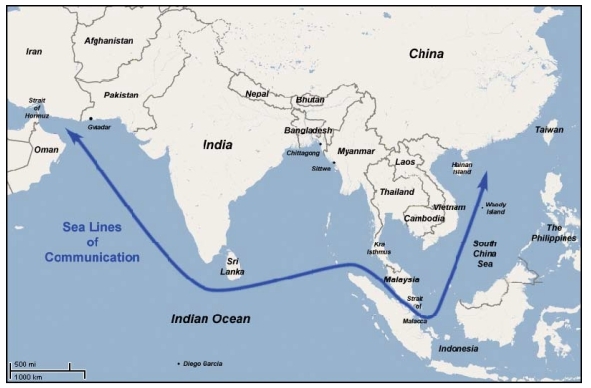 Rakhine state is the site of an expanding Chinese presence, including a port and the terminal of a Sino-Myanmar pipeline and logistical network leading to China's Yunnan province. The violence unfolding in Rakhine over the past months appears to be the execution of the well-documented US "String of Pearls" containment strategy versus China, and mirrors similar violence being carried out by US proxies in Pakistan. Similar violence in September of last year revealed the name of one of the leading "monks." AFP's September 2012 article, "Monks stage anti-Rohingya march in Myanmar, refers to the leader of these mobs as "a monk named Wirathu." 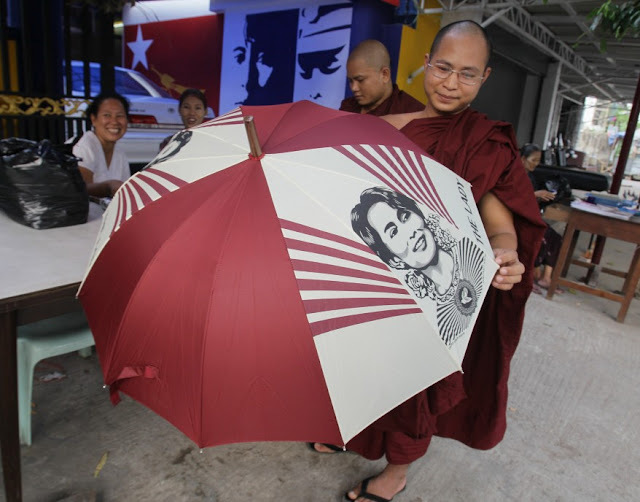 In March 2012, Wirathu had led a rally calling for the release of so-called "political prisoners," so designated by US State Department funded faux-NGOs. Wirathu himself was in prison, according to AFP, for inciting hatred against Muslims, until recently released as part of an amnesty, an amnesty US State Department-funded (page 15, .pdf) Democratic Voice of Burma claims concerned only "political prisoners." 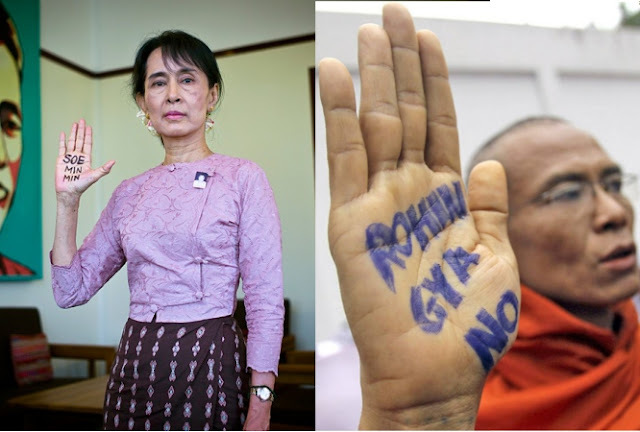 Like their US-funded (and armed) counterparts in Syria, many fighting openly under the flag of sectarian extremism held aloft by international terrorist organization Al Qaeda, we see the absolute moral bankruptcy of Myanmar's "pro-democracy" movement that has, up until now, been skillfully covered up by endless torrents of Western propaganda - Aung San Suu Kyi's Nobel Peace Prize and recent "Chatham House Prize" all being part of the illusion. And just like in Syria, the West will continue supporting and intentionally fueling the violence while attempting to compartmentalize the crisis politically to maintain plausible deniability. The ultimate goal of course is to effect regime change not only in Myanmar, but to create a united Southeast Asian front against China. The unqualified "progress" the US claims is now being made in Myanmar moves forward in tandem with Myanmar's opening to Western corporate-financier interests. The US backing of puppet-regimes like that of Thailand's Thaksin Shinawatra, his sister Yingluck, or Myanmar's Aung San Suu Kyi, installing them into power, and keeping them there is central to projecting power throughout Asia and keeping China subordinate, or as Kagan put it in his 1997 report, these proxy regimes will have China "play Gulliver to Southeast Asia's Lilliputians, with the United States supplying the rope and stakes." Two of these "Lilliputians" are Yingluck Shinawatra and Aung San Suu Kyi, the rope and stakes are the street mobs and disingenuous NGOs funded by the US State Department to support their consolidation of power. 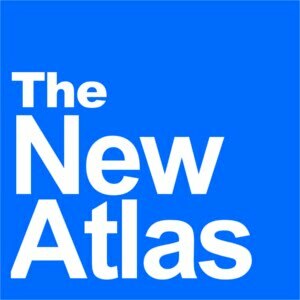 It is essential to look past the empty rhetoric of "democracy," "human rights," and "progress" used to justify foreign-funding and meddling to install servile autocrats like Thailand's Thaksin, Myanmar's Aung San Suu Kyi, or even Malaysia's proxy dictator-in-waiting Anwar Ibrahim, and see the greater geopolitical game at play. It is also essential to expose the disingenuous organizations, institutions, and media personalities helping promote this global corporate-fascist agenda. With Suu Kyi's movement now being exposed as violent, sectarian-driven mobs rather than the "pro-democracy" front it was claimed to be by its sponsors in the West, it remains to be seen whether well-meaning people worldwide turn their backs on this carefully crafted hoax and the corporate-financier interests that created it - and instead seek genuine causes that abandon political struggle for pragmatic solutions.